Samsung has recently launched its new Galaxy Note 3 and Galaxy Gear Smartwatch officially at a press event held in Berlin on September 4th.Now Samsung is officially going to launch its 2 new gadgets on September 17 in New Delhi at Indian Tech press meet. At the press meet, Samsung is expected to launch its new Galaxy Note 3 and Galaxy Gear officially in India.Recently Apple launched its next generation iPhone 5S on September 10th. Both Galaxy Gear Smart Watch and Galaxy Note 3 will be available in stores across India from September 25. 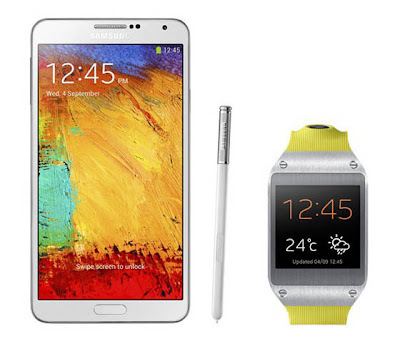 Samsung has yet to announce the price of Galaxy Note 3 and Galaxy Gear. But the expected price of Galaxy Note 3 is around Rs 42,000 while the Galaxy Gear is expected to be priced around Rs 15,000. Samsung Galaxy Note 3 is powered by 1.9GHz Exynos 5 Octa processor.It runs on the latest OS Android 4.3 Jelly Bean. Galaxy Note 3 sports a 5.7-inch full HD Super AMOLED display.The Galaxy Note 3 comes with 3GB of RAM and 32/ 64GB of internal storage, which can be expandable upto 64GB with microSD card slot. Samsung Galaxy Gear sports a 1.63-inch Super AMOLED display and it is powered by a 800MHz processor. The smartwatch comes with 512MB of RAM.The 1.9-megapixel camera on the wristband can take photos or short videos that can be stored temporarily with about 4 GB of internal storage on the watch or you can sent directly to your mobile device.